Economy-wide wage growth is picking up. This has many implications. It also raises important questions. First, a point about wage developments in peer countries. In recent years wage growth has been lower than economists would expect in many economies. Despite falling unemployment almost everywhere in the developed world and a tightening of labour markets, pay inflation has not taken off. Our nearest neighbour is a good example. Despite UK unemployment being at the lowest level in decades, nominal wage growth has remained sluggish. In real terms, it actually shrank from the beginning of last year to the beginning of 2018 (as a weak pound caused inflation to spike). For most of the period from the time the recovery started in 2012-13 Ireland followed this pattern, with little sign of stronger earnings growth in most sectors. 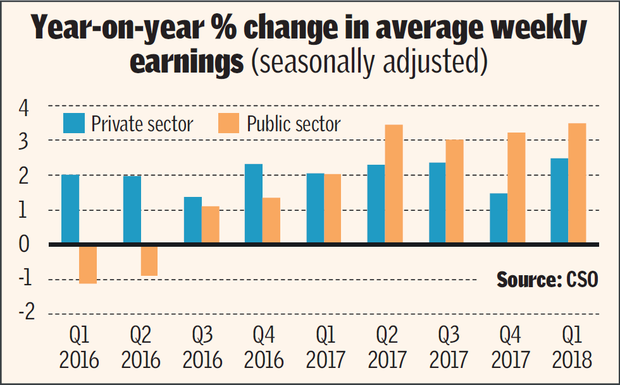 But that has changed more recently, with last year seeing a three-fold increase in the growth rate of both average hourly and weekly earnings to around 2pc. The first figures for 2018, published recently, showed that the upward trend continued into this year. In the first quarter, both economy-wide measures recorded year-on-year increases on 2.5pc. With consumer price inflation close to zero this means that real wages are rising by more than 2pc, well above the average over the past four decades. The clearest and most obvious advantage of stronger wage growth is that it makes people better off. That is all the more so at the moment, when consumer price inflation remains close to zero (falling prices for food and clothing are offsetting higher prices for housing and some services). More widely, higher earnings generate higher demand in the economy. This leads to the kind of feel-good growth that is most widely felt geographically and across income distribution. Higher wages when employment is growing strongly also helps to shift labour resources into higher productivity sectors. That can come at a cost to less competitive companies and sectors, but that is the nature of the economic development process. High wage growth, however, is not always positive. If it results in an economy-wide loss of competitiveness, then Ireland Inc would start pricing itself out of international markets. Ultimately, a small open economy like Ireland can only sustainably remain prosperous if it specialises in some sectors and earns lots of money from the rest of the world from the goods and services these sectors sell to foreigners. That is what Ireland has done, with pharmaceuticals and computer services being the biggest earners. The good news is that the available evidence points to an economy that remains lean and is not uncompetitive. Ireland Inc is earning considerably more from the rest of the world than it is paying out, according to the international balance of payments figures (admittedly, these figures are distorted by multinationals and so should be treated with some caution). Other figures provide corroborating evidence. Goods exports figures, which are compiled separately from the balance of payments numbers and subject to less multinational distortion, show the volume of widgets shipped overseas continuing to grow strongly. The same can be said of services exports (although they may flatter to deceive owing to the same multinational effect). Another indicator of competitiveness is direct investment into Ireland – foreign companies do nearly all of Ireland’s exporting, so they are vital to the entire economic model. Last year saw another strong increase in net employment by IDA-supported firms. They wouldn’t be locating here, and those already here investing more, if the economy were anything other than a good place to make money. Overall, the economy is something of a sweet spot now, with real earnings growth kicking in without there being a competitiveness issue. The one area of concern is where the wage growth is coming from. As the chart shows, private sector weekly earnings growth is running at around 2pc, year on year. The upward trend has been very gradual. There is no sign of runaway wage inflation. The public sector trend is quite different. Since 2016 average weekly earnings for state workers have accelerated rapidly. By the first quarter of this year they were up 3.5pc on the same period in 2017. For a full year, public pay growth has outstripped the private sector by a distance. This reflects the willingness of the Government to allocate large chunks of available additional resources to higher pay in the public sector. It also reflects a return to pre-2008 trends, when public pay growth ran ahead of the private sector in the years leading up to the crisis. When the former ultimately depends on the latter to pay its wages and salaries, this makes little sense. A Public Sector Pay Commission was established by the Government to look into the setting of pay rates. Its setting up offered the prospect of depoliticising the setting of pay, along the lines of the UK model. However, its first major report last year was weak and gave the Government cover to give public sector trade unions what they wanted. The effects are already showing up in the earnings data. So much for lessons having been learned from the crash.